The ever-rising number of the aged population, combined with the lack of retinal regeneration, provides the rationale behind the search for new and effective drug-based treatments for visual impairment; however, the current lack of faithful in vitro models of the human retina that encompass all retinal cell types and display electrophysiological responses to light has hampered this pursuit. The production of retinal organoids from pluripotent stem cells (PSCs) may represent an exciting way forward, although their application in toxicology or pharmacology screening programs currently suffers from a lack of an efficient means to generate a significant number of light-responsive 3D retinae. A new STEM CELLS study from the laboratory of Majlinda Lako (Newcastle University, Newcastle upon Tyne, UK) now describes the application of statistical design of experiment (DoE) methodology in the development of an efficient protocol that enables the large-scale production of light-responsive retinal organoids for drug screening purposes . The authors employed a modified induction-reversal protocol (based on BMP activation to generate neural retina and reversible GSK3β and FGFR inhibition to promote the emergence retinal pigmented epithelium [RPE] [2, 3]) for the initial small-scale six-well plate cogeneration of neural retina and RPE to form organoids. Regarding PSC types, the study utilized three healthy human induced pluripotent stem cell (hiPSC) lines, as well as from hiPSCs-derived from age-related macular degeneration (AMD) patient and a retinitis pigmentosa (RP) patient. While the authors discovered significant variability in retinal organoid generation efficiency, differentiation for five months always provided retinal organoids consisting of a well‐formed outer nuclear-like layer containing photoreceptors with inner segments, connecting cilium, and outer like segments. Encouragingly, each set of organoids also displayed some degree of light responsivity. Analysis of the process suggested that efficient and reliable differentiation relied on optimal cell seeding density and application of crucial growth factors and small molecules, and the authors employed this knowledge to scale their protocol to a larger-scale 96-well plate format. The authors discovered that their new strategy permitted retinal organoid formation with RPE, improved ganglion cell development, and enhanced responses to physiological stimuli. Furthermore, retinal organoids generated in this large-scale format reacted similarly to the adult mouse retina when exposed to the broad-spectrum fluoroquinolone antibiotic moxifloxacin , a known retinotoxin, highlighting their utility in drug screening/testing. The authors hope that their new large-scale differentiation protocol for the generation of light-responsive retinal organoids will soon find applications in drug screening purposes as a viable alternative to animal models. For more on the possible uses of light-responsive retinal organoids, stay tuned to the Stem Cells Portal! 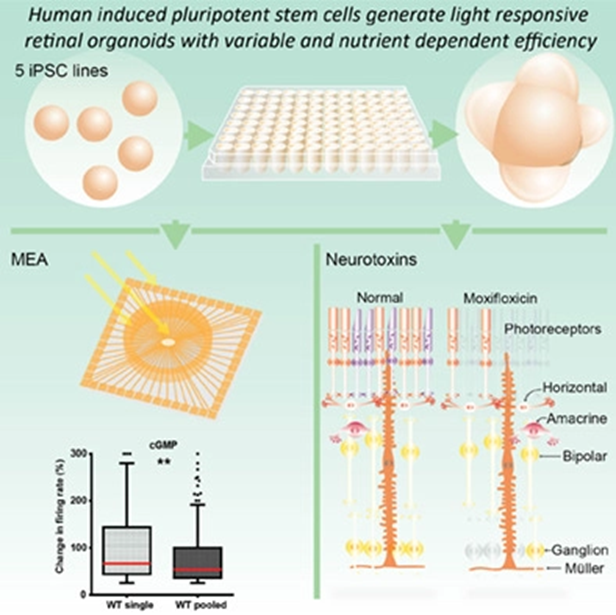 Hallam D, Hilgen G, Dorgau B, et al., Human-Induced Pluripotent Stem Cells Generate Light Responsive Retinal Organoids with Variable and Nutrient-Dependent Efficiency. STEM CELLS 2018;36:1535-1551. Wahlin KJ, Maruotti JA, Sripathi SR, et al., Photoreceptor Outer Segment-like Structures in Long-Term 3D Retinas from Human Pluripotent Stem Cells. Sci Rep 2017;7:766. Kuwahara A, Ozone C, Nakano T, et al., Generation of a ciliary margin-like stem cell niche from self-organizing human retinal tissue. Nat Commun 2015;6:6286. Viola G, Facciolo L, Canton M, et al., Photophysical and phototoxic properties of the antibacterial fluoroquinolones levofloxacin and moxifloxacin. Chem Biodivers 2004;1:782-801.